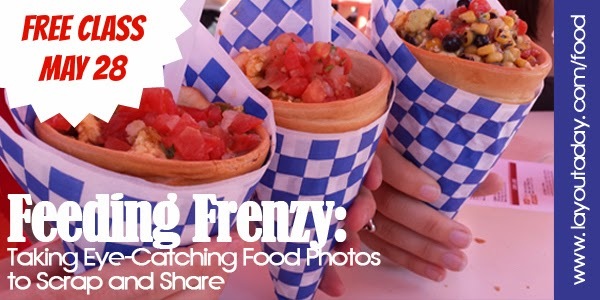 This month's FREE Scrapinar on May 28 is all about photographing food. I admit I've turned into one of those people who snaps the occasional photo of a great meal at a restaurant. I try to be discreet. And I like to take photos of dishes I make here at home. These photos often end up on my pages. To sign up for this free event click here. If you aren't available on the 28th, the event will be available to watch over the next few days. You do have to preregister.